What, you think it’s easy de-icing the kicker? 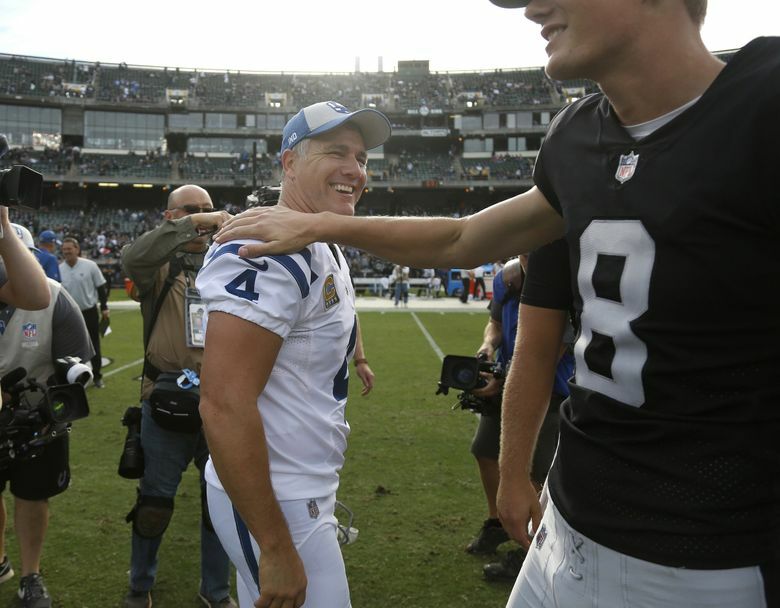 As retired Colts punter Pat McAfee — who also doubled as Adam Vinatieri’s holder — told ESPN: “Before every kick I viewed it as my job being his caddie to kind of keep it light. No matter what the situation is, I’m going to crack a joke. Hank Aaron, the un-asterisked home-run king, says he doesn’t think he could hit today’s generation of 100-mph pitchers. Receiver Juju Smith-Schuster went trick-or-treating in his Steelers uniform. If Bears linebacker Khalil Mack followed suit, just imagine how many sacks he’d bring home. Instances of anxiety and panic attacks are on the rise for college students, according to research by the American College Health Association. A man using a blowtorch to kill spiders burned down his mother’s house in Fresno, Calif. He reportedly got the idea watching Jon Gruden tinker with the Raiders’ roster. Midway University in Kentucky is offering an undergraduate course in Bourbon Studies. Judging by the history of campus frat parties, doesn’t everybody? Robert Marchand, 106, became the oldest person to cycle around France’s national velodrome. Witnesses say they’d never seen a racing bike with a left-turn signal blinking before. Recreational marijuana is now legal nationwide in Canada, effective Oct. 17. Or as more than a few pro athletes now put it: The grass is always greener on the other side … of the border.